Once upon a time, the video-game marketplace was simple. You bought a game, you played the game, and life was good. Today, the always-fractious PC gaming world has thrown a new business model into the ring: free-to-play, where you get a game for nothing but have to pay to enjoy all the features, see all the levels, or to customize your character. While free-to-play has become important in the PC and mobile gaming spaces, consoles have stuck to the old-fashioned notion of providing software in exchange for money. But that’s about to change with the announcement that the Japanese multiplayer brawler Happy Wars is going free-to-play on Xbox Live. The free-to-play model has now branded all three stallions in the console trifecta, with Dust 514 bringing the model to the Playstation 3, and Nintendo building support for free-to-play revenue streams into the Wii U’s online architecture. Microsoft will still get its cut, of course — the game is only free for those who are already paying $60 a year for Xbox Live Gold Membership. But for all those with paid-up Gamertags, the game will be fully playable, no money down, from day one. The developer will pay off development costs by charging players for costume pieces, funny-looking weapons, and in-game items which can be combined for combat bonuses. 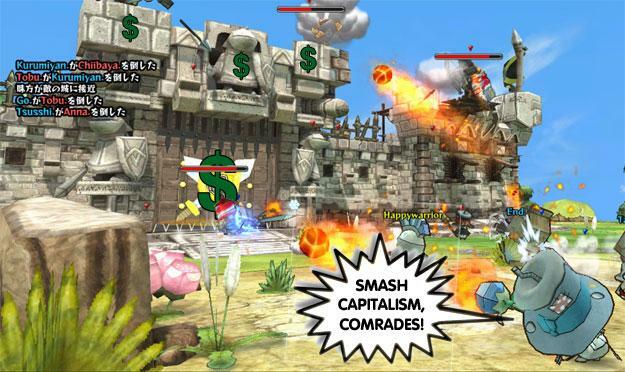 Happy Wars is a gleefully chaotic online free-for-all, in which players storm and defend massive castles, capture statues, and slaughter each other with cartoonish abandon. Like a lot of recent online games, characters are class-based; each player chooses to play as a warrior, a mage, or a cleric, each with different special attacks and team-support powers. A major feature of the game is the 15-on-15 multiplayer matches, which promise plentiful opportunities for teamwork, interesting group dynamics, and loads of chaotic and exhilarating action. That is, if enough players sign up to have 30 people online whenever someone wants to play. And that’s where the free-to-play business model becomes an attractive proposition. A few console titles, like Battlefield 1942 and Counterstrike, have been able to recruit enough people to ensure that there’s a big rumble happening at any time of day. But for most online games, like last summer’s disastrous Brink, the online multiplayer death spiral is nearly inevitable: Too few people are willing to pony up the cash in the game’s first week of release, which means players don’t get to enjoy the massive combat that justifies the game’s existence, which means people aren’t willing to buy the game, and so the cycle continues inevitably as the game sinks into irrelevance. By offering instant access at the extremely tempting price of free, Happy Wars hopes to leap right over that particular pit of quicksand; anyone who tries the game will be playing with everyone else who likes to get free stuff, which is a potentially a very large number of people. Of course, like any ambitious plan, this could go wrong in quite a lot of ways. First and foremost, Happy Wars could just fail to be fun. Developer Toylogic is a neophyte company, whose only track record entries are the nothing-special Teenage Mutant Ninja Turtles game and employing some people who worked on the Wii’s Super Smash Brothers Brawl. While the game’s chibi style makes it easy to come up with fun customization ideas, the notoriously bro-dominated culture of Xbox Live might immediately dismiss the game as “cutesy crap” and go back to huffing and puffing through the usual allegedly-mature, allegedly-realistic shooters. Moreover, by inaugurating free-to-play on the Xbox 360 with a low-profile game like Happy Wars, Microsoft is signaling a reluctance to really throw its weight behind the business model. That’s worrisome because commitment from Microsoft will be tremendously important to the model’s success on the console. In order to maintain a profitable stream of revenue, free-to-play games require frequent updates, with a constant drip of low-cost new content gradually making up for the loss of a big up-front payday. But Microsoft is notorious for the slow, torturous, expensive certification process it requires for all content on the XBLA service; major games have even had to forego important bug fixes because they simply couldn’t afford the time and expense of bringing every line of code through the extensive review Microsoft demands. Toylogic promises regular releases of items to keep Happy Wars fresh, but it remains to be seen if the deveolper has found a way to placate the certification beast enough to get those regular releases through Redmond’s craggy mountain pass and into gamer’s waiting thumbs.